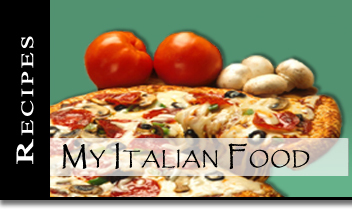 Italian food makes every family dinner table rich in a� lot of different fabulous and tasty dishes.� Most popular pastas, pizzas, meats and Italian desserts are fast and easy to prepare. My passion for collecting recipes has grown a lot since I started experiencing with cooking of some of the Italian foods.� Home made spaghetti with original red sauce has been most popular dish among adults but also kids. For many years I have been fascinate by the culutre of Italians when it comes to food.� The way they prepare it and serve it with! Once in Italian women, told me about how important it is for their family and many more Italian families to sit down and have dinner together on a dailey basis.� Their lives are surroned by lots of fun, siestas and joy! Food is the main thing that brings them together.� They have a family dinner, believe me you will see 15 or more people joining.� That is why for Italins food is very important, the way the prepare it and how much heart they will put in preparing it.� They drink a lot of wine, especially red wine, which makes the food taste even better.� I am not Italin myself, but during my traveling years in Europe I did collect few great recipies that I would like to share with you. My family eats Italin dishes at least twice a week, we love it and kids as well.� In my Italian recipies you can find something for everyone, every taste! Either you like chicken, beef or pork or vegatables, sweets�lots of cheese and pasta you will satisfie any appetite. I do have to recommend very popular recipie which will stay in my mind forever, it is the dessert that will melt your heart when you will eat it! Homemade Italian Tiramisu!!!! Check out the recipie, make it and enjoy it, I am sure you will!! !